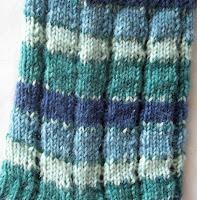 My Cyan striped Cross Purpose socks were finished up late Saturday afternoon. They please me endlessly! The color, the fit, and –the eyelets—Yes-eyelets—since the pattern of 5 X 1 ribbing was enlivened by having eyelet purl stitches. The toe has a square shape—I never see this toe being used by anyone else—but I like it—Look at the toe detail in the socks flat—and here—a square toe is just a flat toe – with the decreases in the center, not on the side! Then, before the needle could cool down to room temp—I cast on for another pair of socks.. BUT—these aren’t for me! These socks are going to be for a fund raiser—last year—for the first time, my DD participated in the (NY) Avon run/walk for Breast Cancer Research. She’s decided to do it again—So she has committed to raising another $1,800. Last year one her more successful fund raiser was a Craft Show—and all her crafty friends (and her mom) contributed one of kind hand made items. I made a half dozen or so double knit potholders—and some jewelry –earings mostly. This year—the plan is for a pair of socks (the pair I am knitting now) and a couple (2 at least!) pairs of yoga socks (toeless/heel free socks) –and some more potholders, too! These socks—are the same as the Cross purpose ones--Well not quite. I always have eggs over easy, potatoes, rye toast, orange juice and coffee. He always has eggs (whites only) scrambled, subs lettuce and tomato for potatoes, with whole wheat toast, tomato juice and tea. I butter my toast—he uses jelly! The same order—but every little detail different! So it is with these new socks—They are just like the ones I just knit—and not! But with the same simple stripes—and each color change marked by a round or two of fake fair isle. In a 5 X 1 rib—with out eyelets—but with beads. 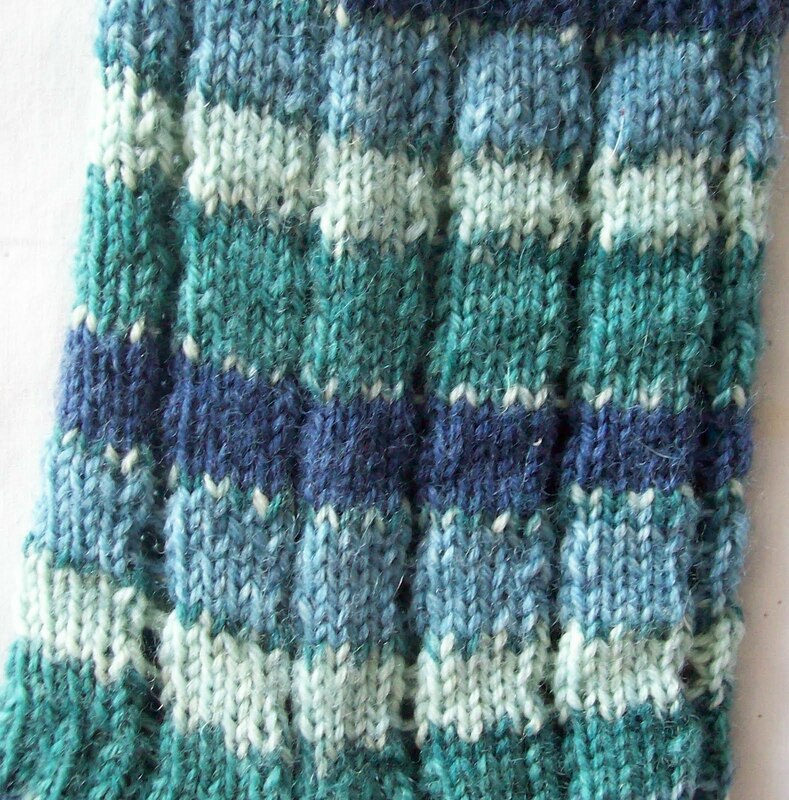 And just as much fun to knit—with strong horizontal bands of color –and a strong vertical stitch pattern. A pastel color way—but a strong contrast element –something that I always like! As you see—they are slightly lop-sided right now. 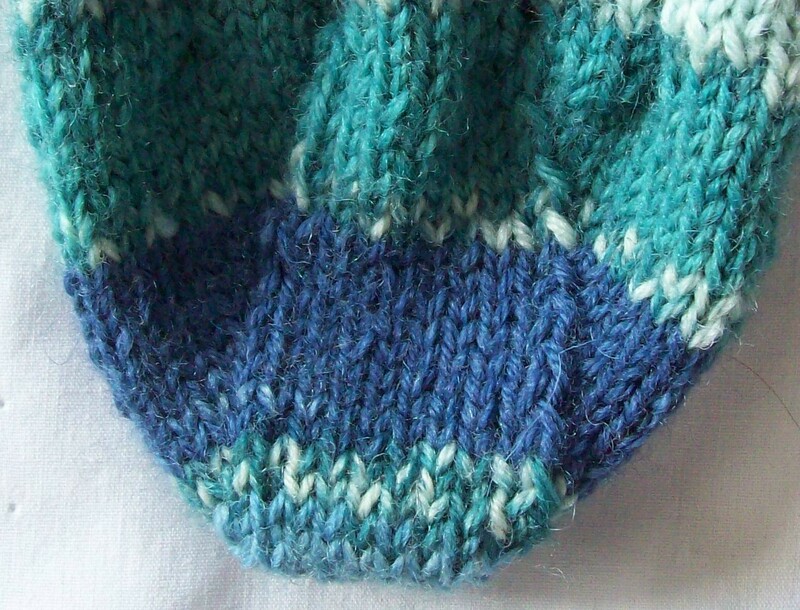 I thought I had divided the yarn so that I would have matching stripes—and by round 5—they were different. I was going to leave it be—and go with random mismatch stripes—but by color 3 (the lilac) I realized—the stripes did match—except I started slightly off. So I stop and worked one sock till it met the other—and when I am finished—I will undo the cast on--on both socks--Unravel the longer one till it matches the shorter—and then work a matching edge/bind off. I am thinking now perhaps a bit of fluff—some beaded lace to drape over and hide the 1 X 1 ribbing at the cuff. The silvery pink beads –some are so pale they look clear—some are a darker pink --are nestled in the purl of the rib—and disappear at times--but the gentlest stretch—and there they are! The beads are floating on the purl bump—and rather easy to position –I worked a beaded round on the subway this morning! All pretty pinks and pastels and sparkly—Won’t they be the most wonderful thing to wear on some dull, grey, cold winter's day? A pretty luxury inside practical boots or shoes—socks to warm the spirit as well as the feet! 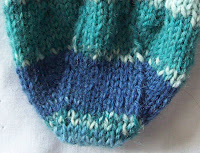 The rib pattern will continue (sans beads!) right down to the toe—to help make these a ones size fits most sock—I’ll make them about long enough for a size 8 to 9 shoe—the average size in the US today for a woman’s shoe. I photographed them (late yesterday afternoon)—and since then-- worked a few more rounds—they are now 4 inches along!—almost double the length in the image. They will, I think- be slightly taller than I usually make socks for my self. I know I am going to hate giving these socks away—but Pink doesn’t figure heavily in my wardrobe. Not to mention that, beside this yarn, I have some JoJoland sock yarn in pink and grey, a skein of Lion Brand in the Cotton Candy, (a bubble gum pink with purple and lime green accents!) and a hand painted skein of (I forget exactly which brand) in Pink Flamingo—and blend of cotton/wool/spandex in shades of pink--an label-less skein I bought at a fund raiser a few years ago. A pretty impressive collection of pink sock yarn for someone who owns perhaps 1 or maybe two outfits that contain pink! The Cross Purpose socks are gorgeous! Why do your socks have to match your outfit? Mine never do - it's more fun that way! I love your finished socks! I'm so impressed that you completed a beaded round on the subway! That's wild.